At times one may want to control the transmission of rotational motion by engaging or disengaging an axle from a motor. Such a mechanism is called a clutch. LEGO has special parts that can be used to make a clutch. However, these are relatively hard to find, and take some force to engage or disengage. Many clutch designs simply move gears back and forth across one another, but this causes the gears to grind and eventually wears down the parts. In these systems, the clutch does not engage smoothly. I was aiming to design a clutch that can engage or disengage with very little force, while also being made of common parts. 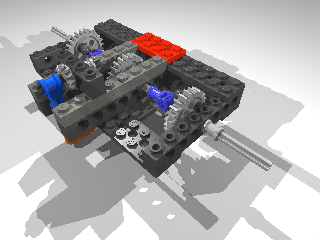 Below is my most recent design which relies on the easy meshing between two pin with towball pieces on the 24 tooth gear and the Technic connector with axlehole on the central drive. The only parts that are less common are the two Technic disks with axlehole. These can probably be replaced with other parts. Perhaps axles extending from the lever would work. Here are the instructions in pdf format, as well as a zip file containing the LDraw files. I will post a description of how I made the animations. Note that the engaging lever even pauses until the coupling mechanism meshes with the towball pins. This mechanism can be powered with a motor coupled to a differential. This enables one motor to control both the drive and the switching. Rotating the motor in one direction will switch to one side and drive it, while rotating the motor in the other direction will switch to drive the other side. I will post a detailed description of how to do this as well.